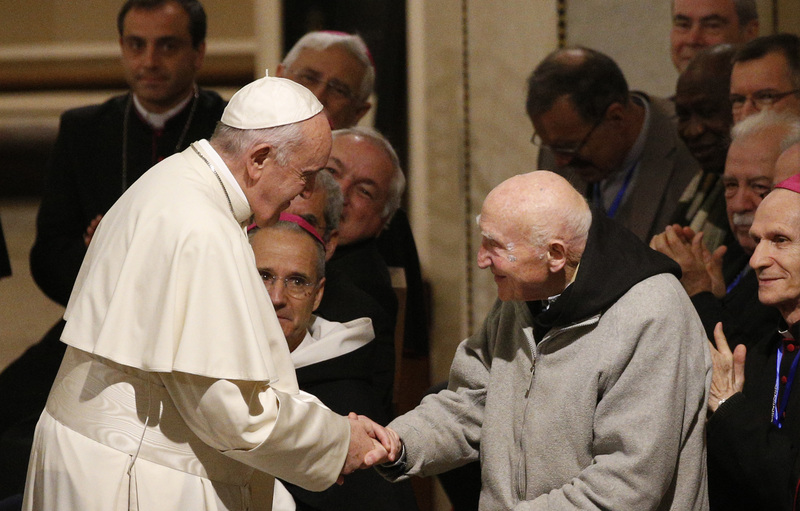 Pope Francis greets Trappist Brother Jean-Pierre Schumacher, 95, the last survivor of the 1996 massacre in Tibhirine, Algeria, who now lives in Morocco. Brother Schumacher was among priests, religious men and women and members of the ecumenical Council of Churches at the cathedral in Rabat, March 31, 2019 (CNS photo/Paul Haring). Pope Francis concluded his historic visit to Morocco by celebrating a Mass enlivened by a mixture of Gregorian chant with the beat of drums and the rhythmic dance, music and song of 10,000 faithful—most of them migrants from countries in sub-Saharan Africa—at a sports stadium in Rabat, the capital city of this Muslim-majority country. It was the largest Mass ever celebrated in this land, where Christianity first came between the second and third centuries but where only a tiny presence remains today. Bishops and priests from Morocco and other countries concelebrated Mass with Pope Francis in a sports complex on the outskirts of the city. Among those attending the Mass was Brother Jean-Pierre Schumacher, O.C.S.O, the last monk survivor from the monastery of Tibhirine in Algeria. (Seven Trappist monks were killed at Tibhirine during the Algerian civil war in 1996.) Prayers were read in Arabic, French, Spanish, English and Italian. Francis warned believers against “the temptation of reducing the fact that we are his children to a question of rules and regulations, duties and observances." After Mass, Pope Francis drove to the airport to take the plane back to Rome, and en route he will give a press conference. Interesting and this is where the new emerging Church will be found. Second and third centuries Church came to this land but today the faithful are less than 1% of the 35 million population.. This is a similar experience in the entire Arab nations and middle east. They got the gospel first but that gospel was gone. It is difficult to understand how the Church at the time lost the entire territory to Islam that came in the 7th century.